Prime Minister Yousuf Raza Gilani has declared unequivocally in the National Assembly that Pakistan wants peace but if war is imposed on us then we will stand united like a respectful nation. The prime minister briefed the National Assembly about the situation in the aftermath of Mumbai attacks but he failed to impress anyone, because of his lackluster and dumb approach. What he needs to do is to foster diplomatic interactions with different heads of government following attacks in Mumbai and start concerted and focussed efforts to unite the political leadership of the country on a single issue as well as the government’s decision to implement the United Nations Security Council resolution to ban some militant outfits. But he needs to be very careful as far as the banning of these organizations is concerned. PM should understand that he could never appease India and India will keep on demanding. 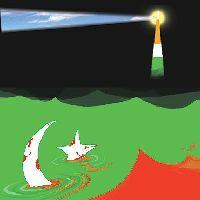 India knows the shallowness of its demands and its accusations and as the weakness of Pakistani leaders is exposed, they are twisting our arms. President Asif Ali Zardari has assured the former US presidential candidate, Senator John Kerry, Pakistan will not allow any terrorist activity to be carried out from its soil. Senator Kerry also asked Pakistan to cooperate with India in the investigations into the Mumbai attacks. India should understand it once and for all that We want peace but the nation and the armed forces are fully prepared to defend the motherland if war is imposed on us. This is not the same Pakistan of the past, and this time India will be met with fierce and hard response. The world knows that our leadership is a JOKE. The are taking full advantage of it. India has only hyped up it campagn against us because they know how intelligent people are sitting in corridors of power. I think they should feel a lil shame of being totally incompitent for their posts. By the way I love to watch gillani sb super dashing outfits and zardaris sbs ear to ear smiles when the nation is being bar-b-cued by res of the world BRAVO!